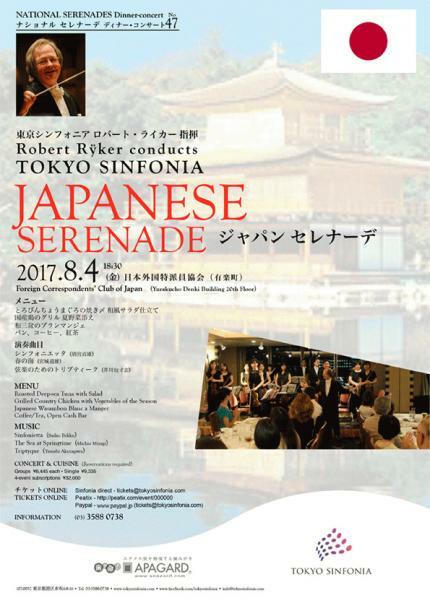 Robert Rÿker and the Tokyo Sinfonia welcome you to another of their “hugely enjoyable” FCCJ dinner-concerts. The 20th floor aerie of the Foreign Correspondents’ Club of Japan overlooks the gardens of the Imperial Palace from on high atop the Yurakucho Denki Building and offers a stunning view of the setting sun and Tokyo at night. Combining aspects of both a gracious dinner and an entertaining concert, the perennially popular series of national serenades has won much praise for its imaginative programming, inviting presentation, and friendly rapport with the audience. Interspersed between the courses of traditional Japanese cuisine – Roasted Deep-sea Tuna with Salad, Grilled Country Chicken with Vegetables of the Season, and Wasambon Blanc à Manger – our Japanese Serenade evokes the timeless beauty of the land of the rising sun in concert: Sinfonietta (Sadao Bekku), The Sea at Springtime (Michio Miyagi), and Triptyque (Yasushi Akutagawa).